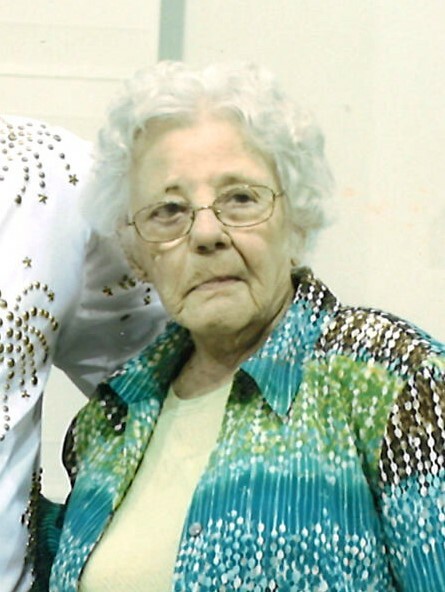 Greenwood, MS: Mrs. Betty Halbert Harrington of Greenwood departed this life on Friday, February 1, 2019 at the age of 99 years, 5 months and 18 days. Visitation is Monday, February 4 at St. John’s United Methodist Church from 10 A.M. until Noon. A graveside service will be held 3 P.M. Monday at Pleasant Ridge Baptist Church Cemetery in Woodland, MS. Rev. Billy Ray Stonestreet will officiate. Betty was born in Artesia, MS to Pete and Sadie Halbert. Her major role in life was caring for her family, and especially for her Down Syndrome daughter, Hilda. She moved her family to Greenwood in 1957 for Hilda to have access to the services of Greenwood’s Little Red School House. She was a faithful member of St. John’s United Methodist Church and was an active member of the Wallace Sunday School Class, as well as her Church Circle. She supported the work and service of St. John’s Rainbow Sunday School class that has served Special Needs youth and adults in Greenwood for many years. She shared her good sense of humor and her nurturing nature with her many friends as well as with the friends of her children. She lived a blessed and full life and continued to keep a close relationship with her children, grandchildren and great-grandchildren, of whom she was very proud. Mrs. Harrington is preceded in death by her husband, Hiller Harrington, her parents, and a sister, Rachel Ann Hines. She is survived by two daughters, Carolyn McAdams and Hilda Harrington, both of Greenwood, two sons, Ruble Harrington of Greenwood and Lewis Harrington (Barbara) of Savannah, TN, a sister, “Biddy” Kirkpatrick of West Point, MS, four grandchildren, Jeff Harrington (Tina) of Nashville, TN, Jonathan Harrington (Anna) of Oxford, MS, Stacy McAdams Montegut (Jared) of Memphis, TN, Lyn McAdams McCool (Michael) of Greenwood, 11 great grandchildren and one great great-grandchild. Pallbearers will be Jeff Harrington, Jonathan Harrington, Jared Montegut, Michael McCool, Graydon McCool and Lawes McCool. Honorary pallbearers will be Dr. Henry Flautt, Russell Lancaster, and Tommy Hargrove. The family wishes to thank her caregivers, Clementine Butler, Lillie Swims and Von Matos, Jessica “Jet” Arabey and the staff of North Sunflower Home Health, and Morgan Moore and the staff of Halcyon Hospice. Memorials may be made to Beacon Harbor, 2712 Hwy 82 East, Greenwood, MS Palmer’s Home for Children, 2688 Main St., Columbus, MS 39701 or the charity of donor’s choice.